How do I configure my Bronto Cart Recovery Integration? Pulse Commerce has a rich integration with Bronto that shares customer and cart data seamlessly between applications to enable customized campaigns that generate revenue and retain brand loyalty. Our deep connection with Bronto captures key customer and cart data from multiple steps in the order workflow to help increase lifetime customer value (repeat purchases and loyalty) and to help customers complete orders from where they had previously abandoned. These are the configuration steps for Cart recovery, conversion tracking and email marketing. 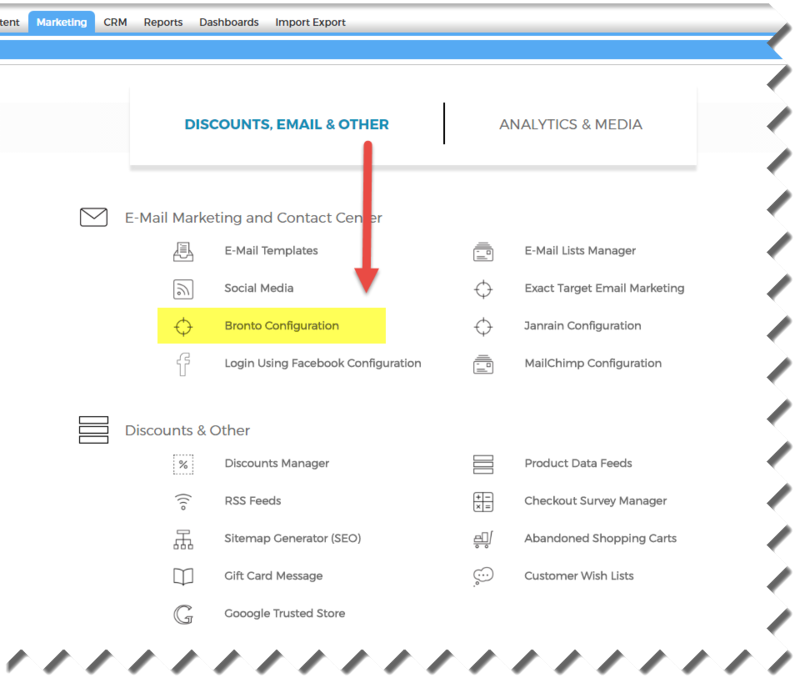 You can configure you Bronto integration by going to Marketing > Bronto Configuration. Here you can enter your details from Bronto to connect your site to your Bronto account. Hover your mouse over the question marks (?) next to each line to get more details on which Bronto element is needed to enter into fields. Tracking Code: This is your Order Conversion tracking code from Bronto. Abandoned Cart Tag ID: You site's specific Tag ID for tracking Abandoned Carts. Enable: Toggle to turn the front end Bronto integration on or off. *Please note that this integration does not support Shipping Tracking URL or Shipping Details for Cart Recovery because they are not available at the time order is placed.